Indonesia’s ambassador to Australia has returned to Canberra after six months, as the two countries take steps towards normalizing relations in the wake of last year’s spy scandal. Ambassador Nadjib Riphat Kesoema was recalled by Indonesian President Susilo Bambang Yudhoyono in November last year after documents released by Edward Snowden revealed Australia had attempted to tap the phones of Yudhoyono, his wife, and several close colleagues in 2009. The bilateral relationship spiraled downwards following the revelations, with Australian Prime Minister Tony Abbott refusing to apologize and Indonesia halting all intelligence and military cooperation. Australian Foreign Minister Julie Bishop and her Indonesian counterpart Marty Natalegawa have been discussing diplomatic protocol between the two neighbors since December last year. “Cooperation is related to the agreement of a code of conduct [on surveillance to be agreed between the two countries]. “The ambassador is returning to Australia very much to send a message that we are making progress in the discussions on the code of conduct … and it’s also an incentive to speed up the normalisation process. If we have someone there [in Canberra], I think it also has an impact on the way the discussions proceed,” Faizasyah said. It has been reported that Yudhoyono phoned Abbott earlier this month about the prospect of normalizing relations by August. The Indonesian president is likely to want to see relations thaw before his term ends in October; however, it is unclear whether or not Australia will give way on spying protocols. In November last year Tony Abbott ruled out agreeing to a no-spying code of conduct between the two nations. 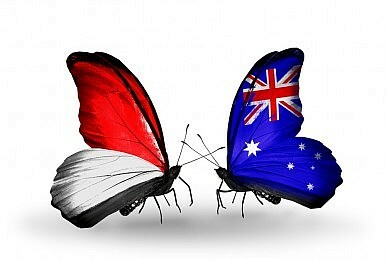 Yudhoyono risks losing face to the Indonesian public if he returns relations to normal without any compromise from the Australian’s. Anti-Australian sentiment boiled over in Indonesia last year with Australian flags burnt outside the embassy in Jakarta. A crude cartoon depiction of Abbott masturbating was also published on the front page of local broadsheet Rakyat Merdeka. Total bilateral trade between the two countries is worth around A$11 billion ($10.2 billion) annually, much of which comprises Australian agricultural exports to Indonesia. Despite the fiery rhetoric, trade doesn’t appear to have been affected; for example, Indonesia’s planned relaxation of rules on cattle imports is expected to see live exports from Australia soar more than 70 percent this year. Australia’s unilateral policy of returning boats carrying asylum seekers to Indonesia is another issue that has also raised the ire of the Indonesians, but it is highly unlikely Abbott will compromise on what is such a key domestic policy. Natalegawa slammed Australia earlier this month after it emerged that the Australian Navy added three asylum seekers to a boat before turning it back to Indonesia. The three men had been taken off a prior boat to be given emergency medical assistance. Australian Navy vessels also violated Indonesian waters in January this year during an asylum seeker related operation, later apologizing for the breach. It is unclear whether or not Australia’s asylum seeker policy will play a role in the diplomatic negotiations to resume ties. It is also uncertain if Australia will be willing to make minor concessions to help the outgoing president save face. Canberra may just choose to wait for Yudhoyono’s impending departure. While Abbott and Yudhoyono take the first steps in repairing frayed relations.